Quite an effort from Spain and Holland to produce over 120 minutes of World Cup football that produced so few moments of joy. 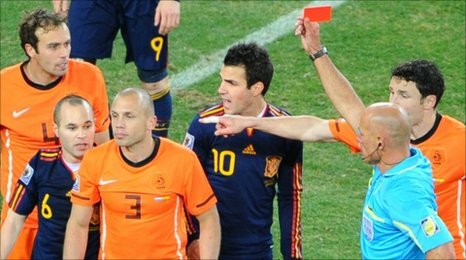 Howard Webb was left looking as card happy as Victoria Coren in a match that looked almost impossible to referee. The Englishman managed as well as any referee could have. Spain's win is being called a "victory for football". On the night I suppose that was true, Holland turned up with an inferiority complex that manifested itself in a performance that strayed well past organised and ended up on the wrong side of ugly. A couple of things I thought about last night as I lay in my sickbed watching the game though. Firstly, what kind of luck do you need to have to be ill on World Cup final day? Well, my kind of luck apparently. Secondly, this has not been a bad World Cup. Not vintage perhaps but not as rank rotten as we might have feared a few games in. Thirdly, Spain are clearly the best team in the world and deserve to be officially crowned as such. But. For all the vilification of Holland it must be said that Spain brought little to the party last night for long stretches of the game. That might have been nervousness. It might have been that Holland's gameplan - although ugly and frequently taken too far - was actually fairly effective. As a Scot, the technical ability of this Spanish team is almost enough to make me cry with envy. But they scored only seven goals in eight games. They were prepared to be functional above all else. Dutch heads may be hanging in shame today. But if Spanish 1-0 victories are the future of the game, then "football's victory" might just turn out to be quite hollow. SPL In Europe: Eureka! Europa!